Similar to the British system, Article One of the United States Constitution gives the House of Representatives the sole power of impeachment and the Senate the sole power to try impeachments of officers of the U.S. federal government. (Various state constitutions include similar measures, allowing the state legislature to impeach the governor or other officials of the state government.) In contrast to the British system, in the United States impeachment is only the first of two stages, and conviction during the second stage requires "the concurrence of two thirds of the members present." Impeachment does not necessarily result in removal from office; it is only a legal statement of charges, parallel to an indictment in criminal law. An official who is impeached faces a second legislative vote (whether by the same body or another), which determines conviction, or failure to convict, on the charges embodied by the impeachment. Most constitutions require a supermajority to convict. Although the subject of the charge is criminal action, it does not constitute a criminal trial; the only question under consideration is the removal of the individual from office, and the possibility of a subsequent vote preventing the removed official from ever again holding political office in the jurisdiction where he or she was removed. Impeachment with respect to political office should not be confused with witness impeachment. ^ Baltzell, George W. "The Constitution of the United States - We the People - an easy to read and use version". constitutionus.com. Retrieved April 12, 2019. ^ "Brazil's Dilma Rousseff to face impeachment trial". BBC News. May 12, 2016. Retrieved November 13, 2016. ^ "The Prevention of Insults to National Honour (Amendment) Act of 1971" (PDF). Retrieved July 2, 2017. ^ Cowell, Alan (December 13, 1991). "President of Italy is Making Political Waves". The New York Times. ^ "Italy parliament rejects bid to impeach President Napolitano". Reuters. February 11, 2014. ^ Horowitz, Jason (May 28, 2018). "Italian President's Loyalty to the Euro Creates Chaos". The New York Times. ^ "The Constitution of the Republic of Lithuania". Retrieved April 4, 2016. ^ "Lithuanian Parliament Removes Country's President After Casting Votes on Three Charges". The New York Times. April 7, 2004. Retrieved April 4, 2016. ^ Chan-Robles Virtual Law Library. "The 1987 Constitution of the Republic of the Philippines - Article XI". Retrieved July 25, 2008. ^ a b Gay, Oonagh (November 30, 2004). "Standard Note SN/PC/2666: Impeachment" (PDF). House of Commons Library. Retrieved November 1, 2009. ^ a b U.S. Constitution. Article I, § 3, clause 6. November 12, 2009. ^ "U.S. Senate: Impeachment". 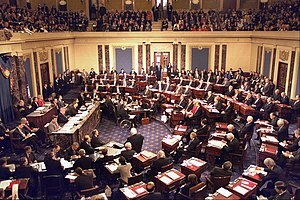 www.senate.gov. Retrieved September 19, 2018. ^ "Impeachment History". Infoplease. Retrieved July 12, 2013. This page was last edited on 23 April 2019, at 16:36 (UTC).